The 2nd JBFEM Symposium: Ekuitas Award 2019 will be conducted on July 4-5, 2019 in Penang, Malaysia. We invite scholars around the world join to disseminate research article in business and social science. This event is organized by SSBRN and hosted by STIE EKUITAS. The symposium provides networking session for participants. Three best papers will be awarded to participants. Award-winning authors will receive a Best Paper Award certificate and free registration fee for the 3rd JBFEM Award & Symposium 2020 in Tokyo, Japan. The conference theme is “How Business & Industry Immerse in the New Era of Society 5.0“. All presented articles will be published in our affiliated journals after additional review process. Final acceptance is subject to further editorial review. There is no publication fee for our affiliated journals. International Journal of Business & Globalisation (Indexed by Scopus, Academic OneFile, etc). Holistica Journal of Business & Public Administration (Indexed in DOAJ, Ebsco, Proquest, etc). Journal of Business & Finance in Emerging Markets (Indexed in Google Scholar and Cross Ref). Review of Behavioral Aspect in Organizations & Society(Indexed in Google Scholar and Cross Ref). International Journal of Society System Sciences (Indexed in Academic OneFile, Info Trac, Inspec, etc). 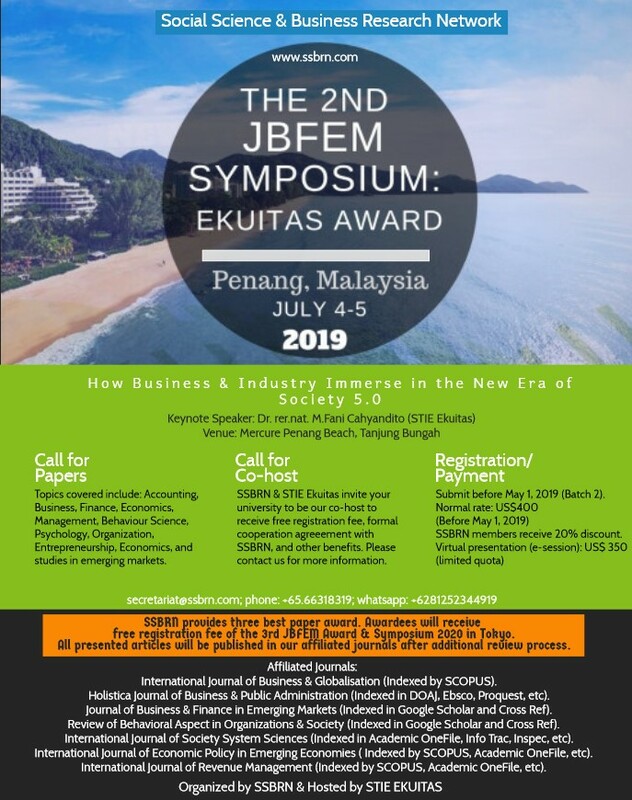 The 2nd JBFEM Symposium: Ekuitas Award 2019 will be conducted in Mercure Penang Beach. It is a four star hotel that is located in the Tanjung Bungah. It also has private access to Penang Beach. From Penang International Airport, participants can use either GRAB for around RM30 (equal to US$7) or airport taxi for around RM58 (equal to US$14) . This trip takes approximately 45 minutes.